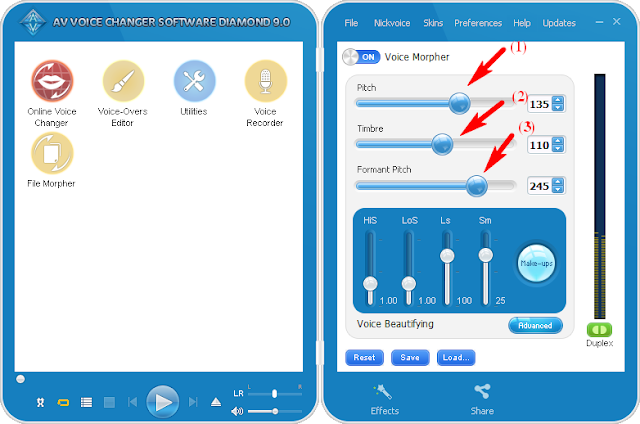 Do voice changing, voice-over, voice dubbing; mimic voice in real time; change voices in songs; change voice during calling/chatting with VoIP programs (Skype, Facebook, QQ,...) by using Nickvoice of Voice Changer Program. Open VCSD and by move the pointer (1) to change your Pitch, Pointer (2) to change your Timbre. 2 Action will make your voice to almost same Santa voice as you like. The Pointer (3) will adjust the voice is beter. Move it as you want for better result. The cursor's position will define how your voice changed. 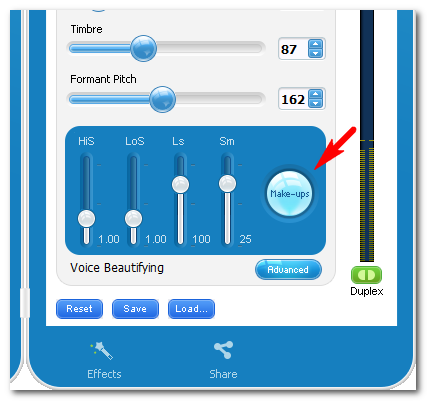 To change my voice like Santa Claus, I move cursor to 61% Pitch and 87% Timbre. I suggest you to use Make-ups or Sound Quality and the Equalizer to make your voice (Santa voice now) more warmer. Use Make-ups or Sound Quality, Equalizer if you want to become pro. Learn how to use the Nickvoice of Voice Changer Software Diamond. 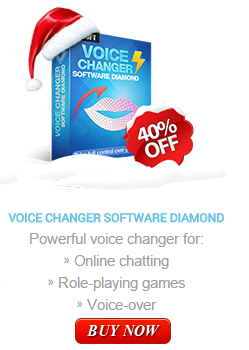 Click here if you want to buy full Voice Changer Software Diamond to make a Santa Voice Changer (With 30% Discount, only for this site) and more. Just wait for a minute: If you want to buy full PRO Voice Changer Software, please use below link to get 30% OFF discount from audio4fun. Only for Nickvoice.com visitor. The Leader in Voice Changer Software Innovation, discovering new dimensions in voice morphing. Copyright © 2013 NVC. Theme images by michaelmjc. Powered by Blogger.